Welcome to the Internship section of the ISCB-Student Council website! As a student-managed body, we understand it is important to get the right guidance and a good mentor during the early-years of training. We aim to address these challenges by organizing internships for undergraduates and graduate students of developing nations in collaboration with leading international research labs and institutions working in the field of computational biology. If you are a group leader or a student, scroll down to learn more about our internship initiative. 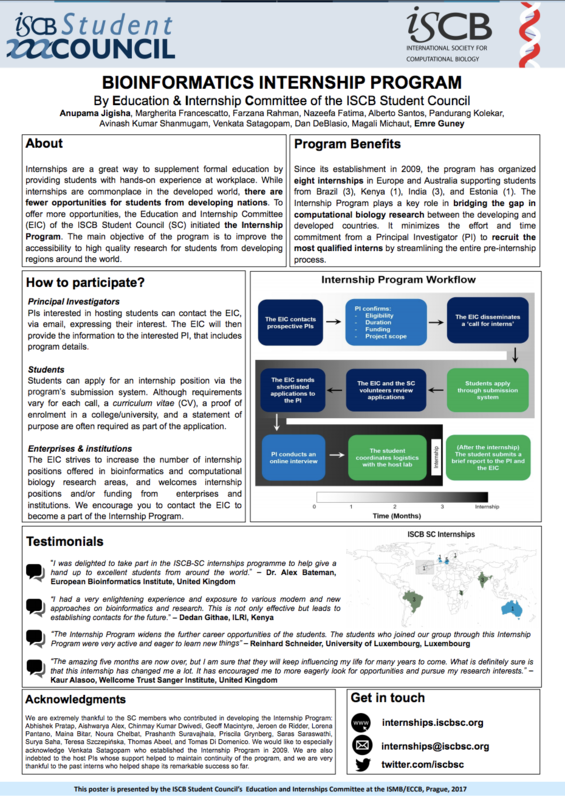 The Internship Committee of ISCB Student Council is grateful for your interest in creating an opportunity for bioinformatics students around the world. Should a student participate in the internship program at your institute, under your guidance, it will certainly contribute to the development of the field of bioinformatics. So, thank you for being directly responsible for increasing the reach of bioinformatics research across the globe! 4. Statement of purpose. You may state any additional documentation you would wish to receive from applicants or details about any part of the application. 1. Within a week, the Internship committee will introduce the Group Leader to the person responsible for communication between the Student Council and the Group Leader. 2. Within a week, the committee will advertise the position on the SC website and through the Regional Student Group channel, open applications, and send the Group Leader the related link. 3. One month following advertisement, the committee will close applications for the internship. In the case of having received less than 10 applications per position, the application will remain open for an additional month. 4. Once the application procedure is complete, the committee will recruit SC volunteers to evaluate the applications based on the criteria the Group Leader provides. Evaluation takes one month. 5. The Group will be informed about the result of the evaluations. A list with the top three candidates is then provided to the Group Leader if he or she wishes. 6. If the Group Leader elected to carry out virtual interviews, these will be scheduled within two weeks of the end of the evaluation procedure. 7. After interviews, the Group Leader has an additional week to announce the student chosen for the internship and the Student Council will contact him/her and post this information at the website. Student should be a citizen of a developing country and pursuing a degree program in a university located in a developing country. If you are not sure of your countries classification, please check the IMF website here. Currently enrolled as a full time student. Recommendation letter from supervisor or lecturer. The letter must be printed on the official University letterhead, and should clearly state that the student is enrolled as a full-time student at the university and will continue to maintain the same status during the period of internship. Statement of Purpose (max 500 words). It is expected that the student briefly talks about his/her past experience in bioinformatics and/or computational biology showcasing the skills he/she has learned.